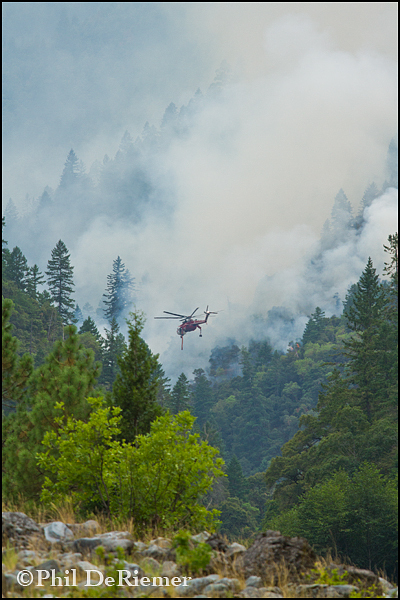 A tanker helicopter works it’s way up the Howard Creek drainage along the Rogue River. The Big Windy fire that kept us away from the Rogue River for our first two trips had, as much as a fire can, settled into a more predictable pattern. It wasn’t crowning from tree top to tree top and it hadn’t jumped the river. Officials were calling it a “healthy fire” since it’s behavior was to creep along at ground level confined to just the understory, despite having burned thousands of acres. The BLM reopened the river corridor allowing trips to resume. 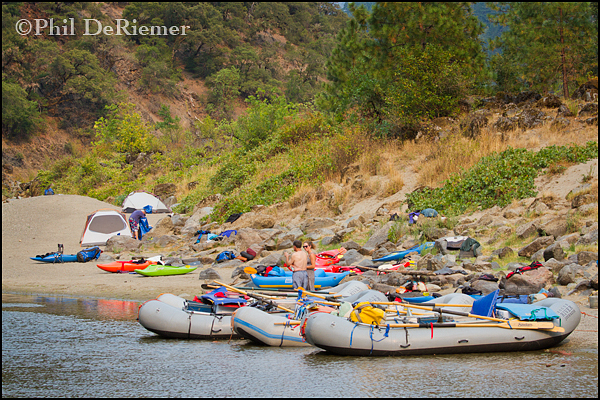 There were still restrictions in place from Howard Creek down to Missouri Creek with regards to where you could stop during the day as well as camp each night. The normal shuttle route over Bear Camp Road was closed meaning trips would have to return via the coastal route. We were pretty excited about the prospects of getting at least one trip in on the Rogue this season. Thanks to Jim Ritter at RRJ we had been keeping our guests on each trip up to date on the fire’s status. This third group was happy to hear about the reopening and they understood there would be smoke for part of the trip- how much and where was up to the wind. In addition to the great white water and instructional opportunities the Rogue presents, we were all pretty curious about seeing the effects of the fire. From our first night’s camp at Wildcat we could see the smoke and occasional flames from the Howard Creek area a mile downstream. Thankfully we had downstream wind and air at camp was clean with blue sky above. Howard Creek, we were told, was where fire crews were putting in a fire line to form the eastern boundary of the fire. Just before we arrived in camp, in the flats above Tyee rapid, a large tanker helicopter dropped down to within feet of the water’s surface and began slurping up water. It flew off in the direction of the Howard Creek drainage and returned to begin the process all over again. Day two started out smokey. Day 2 dawned an eerie, heavy day. The clouds built as we packed up, obscuring the sun and holding the smoke in while the rain began to fall. We made our way past the most active part of the fire visible from the river. It was the most bizarre scene, the trees were green and healthy while underneath, smoldering moss and grass occasionally gave rise to a small flareup. Rarely on the hillside we saw the glow from a burning tree trunk -surrounded by green trees! We could see scorched areas where the fire had come down almost to the water’s edge. It looked as if fingers of the fire had extended down the hill. The worst area was around Horseshoe bend where a stretch of shoreline from Jenny Creek down to the point at Horseshoe had been scorched. We learned later that was the result of a back burn that firemen set to prevent the fire from jumping the river. As the cool, steady rain fell, all I could think about were the positive affects as it washed the smoke from the sky. By the time we made it to camp at Mule Creek the air was clean and altho we set up tents, the skies cleared and the stars were bright. Nine year old Johnny kayaks near camp at Mule Creek. Day 3 dawned clear and the Rogue was looking like it’s old self again. We paddled Mule Creek Canyon and Blossom Bar under sunny skies, watched Johnny skip stones and talked him into his first session of bottom walking (picture big rock, calm pool, start walking, hold breath- oh and heavy parental supervision and approval) all before lunch. Clifford S. exiting Mule Creek Canyon under mostly blue skies. On the last night, after the evening’s festivities and dinner, people wandered off to bed, tired from another good day. Three of us remained, standing at the edge of camp looking up at the night’s sky. Mostly we were silent, enjoying the beauty of the moment. 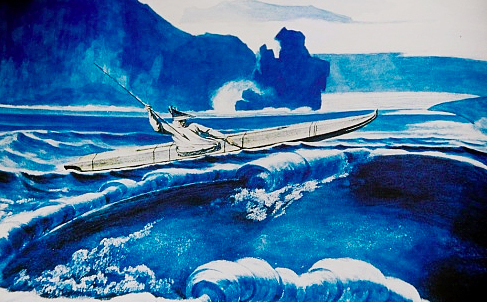 Adventure is defined as “outcome unknown”. 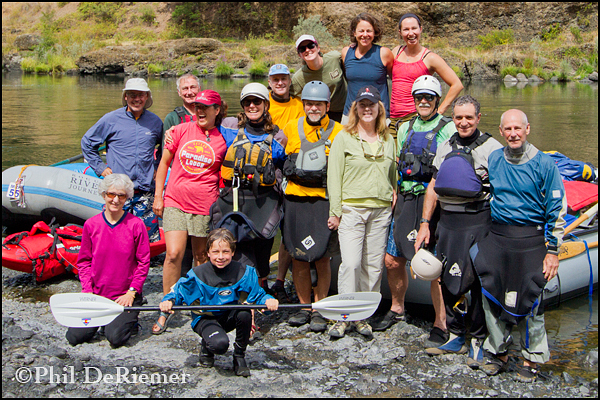 Thanks to all that joined us on this and the trip on the Deschutes this year. 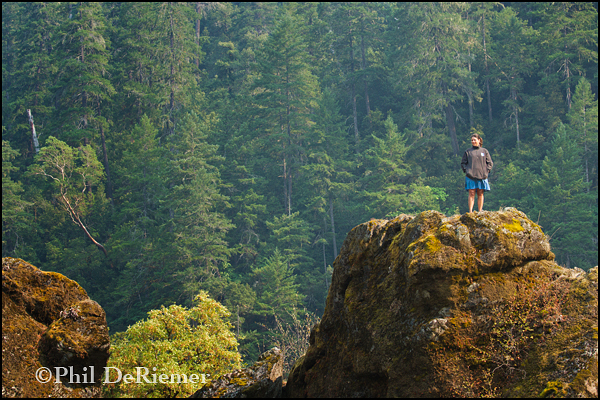 We are grateful for your adventurous spirit and for placing your trust in us and the fantastic crew we work with from Rogue River Journeys. Together we all made some great memories. 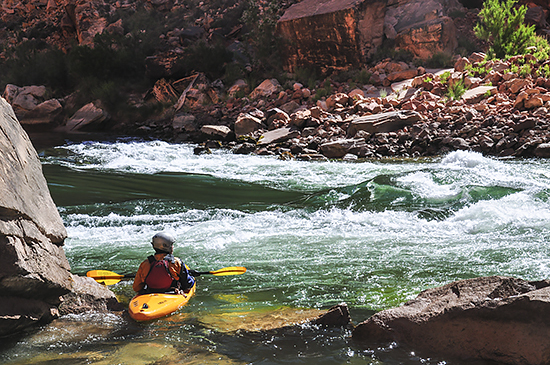 Chances are you have a bucket list of rivers you would love to do some day. 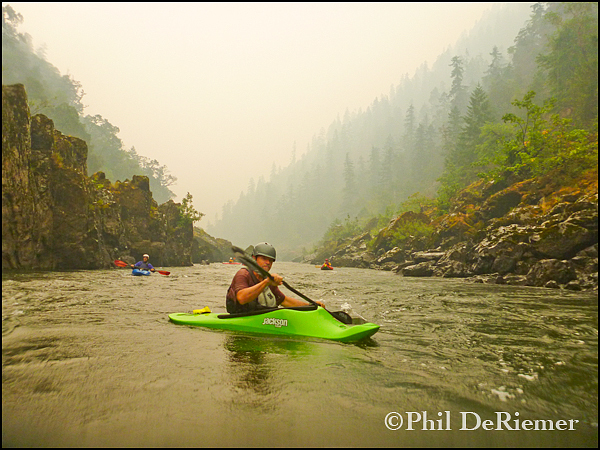 On our list has always been the Selway River in Idaho, one of the original rivers included into the wild and scenic river system back in 1968. The permitted section is forty-five miles long, is located in the rugged Selway-Bitteroot wilderness in Idaho and boasts a healthy forest of Red Cedar and Douglas Fir. The forest service only allows one launch a day which makes these permits hard to get, combine this with a short window of runnable flows and you can see why it might take a while to get on it. We had been invited before, more than once, but for one reason or another it never worked out, until this year. Our good friend Dave S. pulled the permit and put together a fun group of folks from across the country. 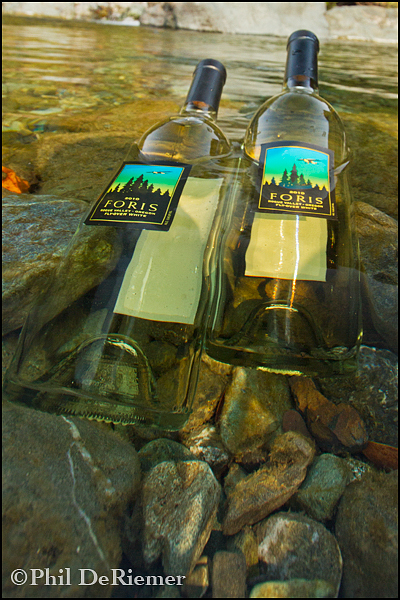 The launch date in mid- June meant it would fit perfectly before our annual Middle Fork Salmon trips. We were 16 people in five rafts and five kayaks on what seemed to be a user friendly flow of between 5,000-6,000 cfs (gauge at Lowell below take out). While we never really added it up, the combined years of river experience were probably close to 1,000 (o.k., I exaggerate, but it was a lot). 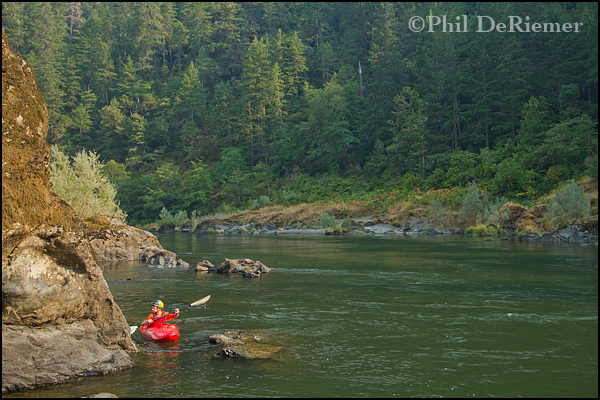 The poor folks who were on their first multi-day trip had to endure a lot of year’s worth of river stories. For the five days we were on the water, we saw no other groups floating the river and we felt like we had the place to ourselves. Clear skies and sunshine were with us for the first three days, then the sun gave way to clouds and rain for the remainder of the trip- it didn’t seem to matter, we were prepared and having an outstanding time! We hope to be back but I’d prefer not to wait another 30 years to make it happen. If it’s not there already, put the Selway on your list. 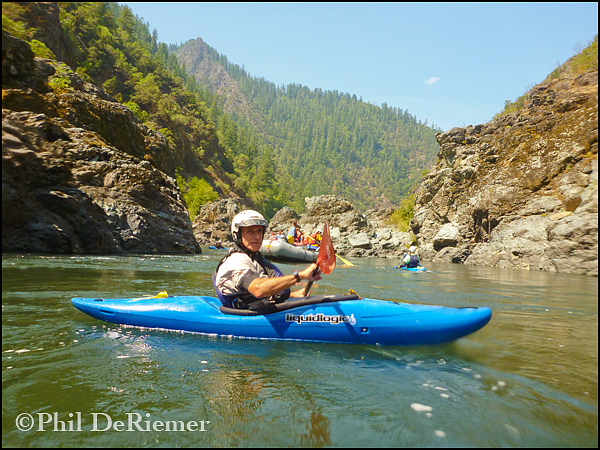 A little aside: Along with us on the trip were Kevin Lewis of Idaho Rivers United and Dave Steindorf of American Whitewater. We learned a lot from these two about the challenges our country’s rivers and their ecosystems face. Please click on the links, learn about the important work these organizations do and please support them. Connecting People – Kokatat And Werner Generosity. 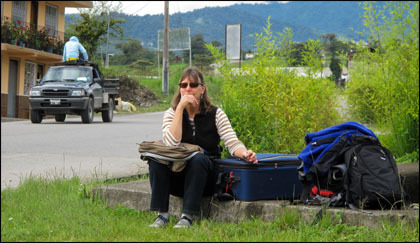 We’ve had the good pleasure to work with some great folks on our overseas trips. There are a lot of people involved that make them possible and run so well. We’ve also had the pleasure of working with some great manufacturers here in the U.S., relationships that go back almost three decades; Kokatat and Werner being a couple of them. 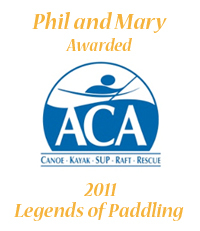 We first traveled to Bhutan to paddle and explore in 2006. Each year we have returned since then we leave behind some of our personal gear for the local guides that work with us. A few of our guests have done the same. Admittedly the gear we all leave behind has seen some use so the idea of new or near-new gear to them is a pretty rare thing. Thanks to Kokatat and Werner paddles we’ve been able to take over care packages of newer paddle tops and paddles and we just want to say hats off to these two companies for their generosity. We can’t take credit for their generosity but we’ll hang onto the memory of the smiles on the guides’ faces when they received the gear. 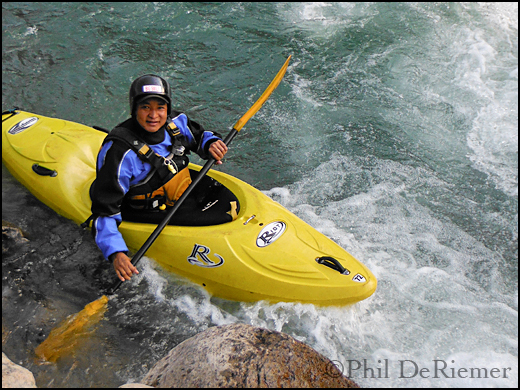 Nepali raft and kayak guide Kali Gurung has been guiding for over fifteen years and has been instrumental in the training of other guides in Bhutan. This is probably his first “new” paddle. 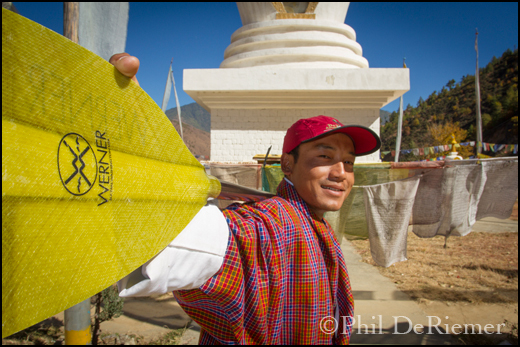 We first met Thinley in 2008 and we’ve watched his abilities grow as the size of his paddle blades shrank. He plans to keep his beater in service while he saves his new one “for special trips like when I work with you guys”. Yoga And Kayaking From Our Friend At Wild Yoga. Our friend Dennis Eagen is a wonderful soul with a wealth of outdoor skills to his credit. He is also a gifted yoga teacher here in our little community of Lotus, CA. He has started a series of posts on his blog about yoga with a focus on paddling that we wanted to share. Keep checking back to his site for updates. It’s been a busy and wonderful fall and early winter for us in 2010. August saw us on the Rogue and the Grand Canyon, September was another canyon trip followed by Phil traveling to Bhutan for the months of October and November. Early December we traveled to Ecuador where we are now prepping for our winter season. First trip starts tomorrow, Christmas day and will run through New Years. Mary somewhere enroute to somewhere else.